Dining Furniture Set Constructed from strong galvanized steel frame and commercial grade hand woven weather-resistant PE rattan won't rust or fade. Garden Table Set have Deep armchair with soft padded cushions to provide cozy seating experience. 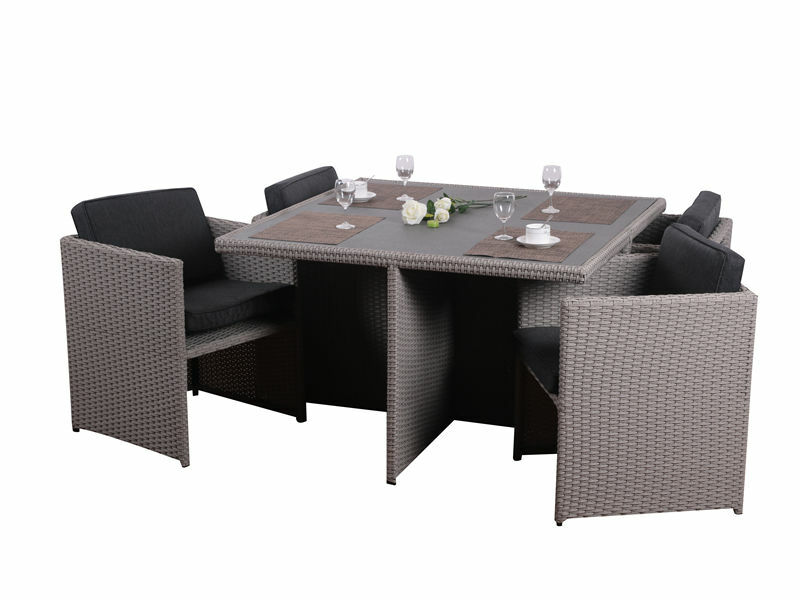 Enjoy the sunshine in style with this Rattan Effect Cube 4 Seater Patio Set. The rattan effect makes the set hard-wearing and durable, and the stylish glass table top is ideal for entertaining guests. This patio set includes 4 armchairs which tuck neatly under the table for space saving storage. Looking for ideal Table Outdoor Dining Set Manufacturer & supplier ? We have a wide selection at great prices to help you get creative. All the Dining Furniture Set are quality guaranteed. We are China Origin Factory of Garden Table Set. If you have any question, please feel free to contact us.